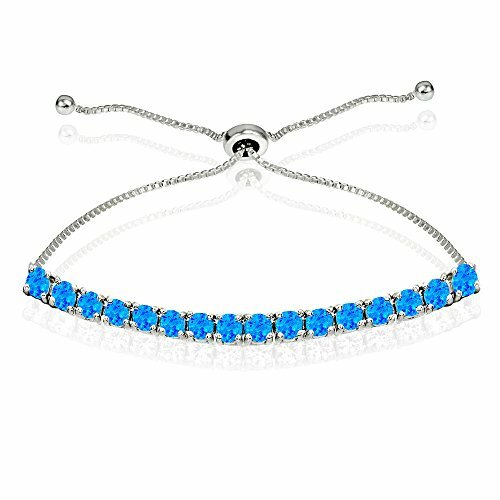 This attractive adjustable bracelet displays a single row of small tiny simulated blue opal gemstones. The pull string chain slides to adjust to your wrist; from 3-inches to 10-inches long. This tennis bracelet is crafted of fine sterling silver, its tarnish free and nickel free. Add this bracelet to you fine jewelry, gemstone jewelry, opal jewelry or birthstone jewelry collections! FEATURE - This fashion bracelet displays a single row of small tiny simulated blue opal gemstones. The pull string chain slides to adjust to your wrist; from 3-inches to 10-inches long. Add this adjustable bracelet to you fine jewelry, gemstone jewelry, opal jewelry or birthstone jewelry collections! Purchase these as bracelets for women or bracelets for teen girls. CRAFTED - This pull string bracelet is crafted of fine sterling silver. It is tarnish free and nickel free.